I am considering starting a new blog. The Adventures of Elvis’s Monkey. Fifteen years ago when my son was three years old a friend gave him a stuffed monkey. He didn’t care much for it. It sat in his room for a while. It got packed in a box and moved with us. Twice. And then it sat in his room some more. As soon as he was big enough our cat, Elvis, adopted the monkey. At first he would just play with it. Throw it around and chase its tail as it flipped and flopped on the hardwood. He’s loved it so much that its fur has worn off in spots. Elvis is now twelve years old and still has his monkey. This morning the monkey was on the green chair in the den where Elvis had slept last night. It was there when I left the house. 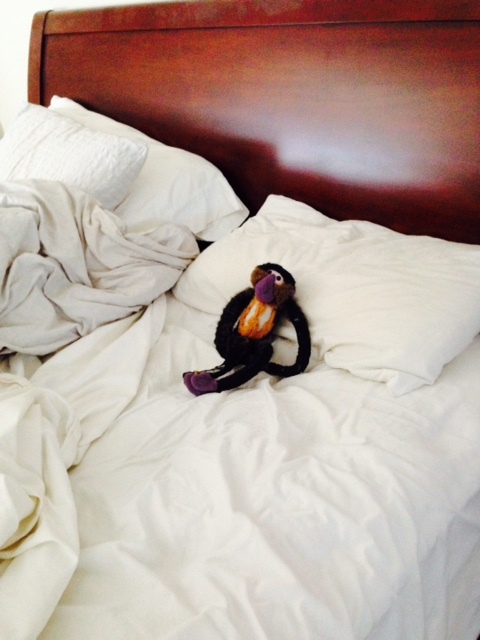 When I got back to the house three hours later the monkey was upstairs in my unmade bed. Sometimes when my husband is at home alone working, he hears Elvis moving his monkey around. He holds it in his mouth and drags it up or down the stairs. But not quietly. He kind of talks to it while he’s doing it. He cries with it in his mouth so it comes out as a a muffled meow. It’s actually really pathetic. I bet they have some stories to tell. Next Article Running. Cheaper Than Therapy. Hilarious! A cat?!! I have never seen such a thing and I had 3 of my own… a very special cat and a very understanding monkey!!! That is so sweet! I have a big basket of plush toys in a corner of the kitchen that my dogs help themselves to and that I find strewn in the unlikeliest places. Portia, though, is enamored with a white monkey my husband won at some fair when we were dating and that I keep around in my office for sentimental reasons. The monkey’s fur is now sticky with Portia’s saliva, after having been retrieved from her mouth way too many times.